The Mercedes 116 chassis chassis automobiles were manufactured from 1973 to 1980. 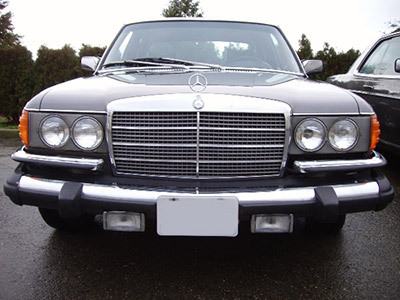 Instead of the twin sealed beam headlights mounted vertically as in the earlier S class the twin headlights were mounted horizontally. This chassis was only produced as a 4 door sedan model. They were extremely advanced for their day when first introduced in 1973. These big S class sedans were fitted with both 6 and 8 cylinder gasoline engines. The first turbo diesel engine was introduced in this chassis in 1978. For a big car their handling is remarkable. Mercedes 116 chassis owners praise the ride and handling even compared with cars manufactured today. If you can find a good one with low mileage, they make great comfortable road cars.